​Honeycomb shelving is all the rage right now, and the best part of this style is that it is super simple to make as a home DIY wood project. You don’t need a lot of supplies, or experience, to get started on the process. We’ve compiled our favorite 16 tutorials from different sites ​on how to make DIY honeycomb shelves. Each tutorial has something unique about it, whether it’s the type of wood used, the tools required, or the unique ways they join the wooden shelves together. Enjoy this simple but stunning DIY project that adds a lot of character and style to your house’s wall. Simple and easy, Josh and Sarah whip out honeycomb shelving using old scrap wood that they found. In this case, they salvaged old cabinet doors and brackets. It just goes to show that you don’t have to use pallet wood to craft your DIY wood project - there are options everywhere. These hexagon shelves are thinner than a lot of the other ones on our list, so if you’re looking for a smaller option that doesn’t stand out as much on your wall, this is a good bet. In this project, they didn’t even have to paint the wood, because they utilized the colors that the cabinets came in. If you’re using scrap wood, you can always throw a few coats of bright paint on the finished product. If you want an easy-to-follow tutorial that gives you a basic but clean set of shelves, click here to see the tutorial. ​We’ve compiled a lengthy list of our favorite easy and small DIY woodwork projects - click here to the collection of projects and tutorials. We love Rick’s projects because he walks you through both the way the project is created AND the problems he encounters along the way. Following Rick’s DIY projects makes you feel human (and like you’re not a big screw up). In this honeycomb shelve project, Rick provides a ton of great pictures throughout his build. In the end, he glues his wood pieces together, which is something to consider if you don’t have a good brad nail gun. Glue should hold up fine, provided you won’t be putting anything too heavy on your finished shelves. You’ll need a good set of clamps if you want to go down the glueing route, and make sure to let the glue dry for a long enough period of time. 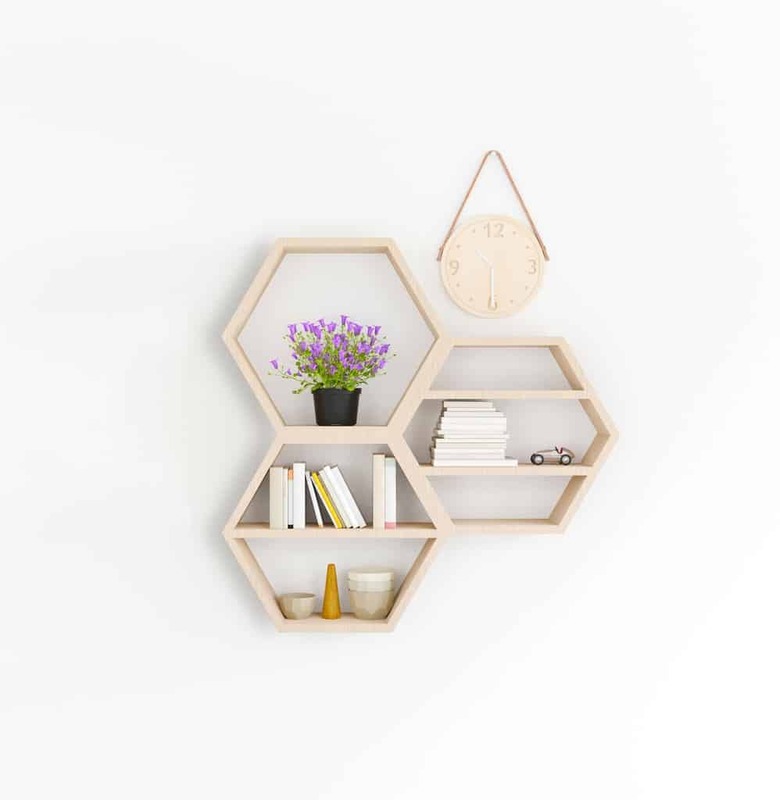 Build It and Style It pros bring a clean, simple design for honeycomb shelves - if you’re looking for a super quick and simple hexagon shelf project, this might be your one. They use pine wood, which is a great option when you’re looking for a good wood, but one that is easy to work with and won’t break the bank. As with a lot of these projects, you’ll use a miter saw to make 30 degree angled cuts, and then attach with a brad nailer. This project recommends sanding the wood, which will give you a much nicer finish. Fill holes with a stainable wood filler and then stain. You don’t need to go that extra effort if you are just painting. ​We’ve talked a lot about a brad nailer in this article, and you might be wondering if you can use a pin nailer instead of a brad nail gun. While a great pin nail gun could be used as a substitute in a pinch, opt for brad nails for this type of project. Family Handyman brings us a project that is a bit more refined and finished. This one does not use recycled, reclaimed, or pallet wood. Rather, it uses a higher quality piece of wood. Their project uses red oak, which is a very very hard wood (they acknowledge this). Another unique thing about this specific hexagon shelving project is that each hex is stand alone and not connected. Another great tutorial for building stylish DIY shelving, this one is really focused on newbie woodworkers. Out of all the tutorials, this one probably has the most pictures of the build process. This tutorial elects to countersink screws into the shelves. The upside is that you end up with a finished product that is a lot more sturdy and robust than using brad nails or wood glue. The downside is that you can see the screw holes from the finished product. For many, this might only add to the rustic look and feel of the shelves, so you might actually prefer this. ​Looking to start woodworking with your kids? We’ve gathered our favorite projects to do with your children. Katherine does a great job showcasing how valuable a miter saw is to this project. Every one of the projects we feature here requires a series of 30 degree angle cuts, and the miter saw is the best tool to do this. Doing it by hand is possible, but risky that you’ll end up with shelves that aren’t square. An alternative to the miter saw is to use a table saw, if you have one. Table saws are a lot harder to use, and much more expensive. But, they can cut at 30 degree angles as well. There is a great short video that shows you the steps that this project goes through. And, a cool twist that Katherine uses: instead of clamping her pieces of wood together while the wood dries, she uses a roll of tape to keep it together! ​We could see this working great because of the angles of the wood - they should dry square with this method. This is a great idea if you don’t have any clamps to help keep everything secure while drying. ​Don’t stop at shelving - make your own DIY farmhouse dining room table with our tutorial. Suncatcher Studio has a great tutorial for building wooden hexagon shelving units. They utilize both glue and wood screws, which provides the ultimate in secure finishes. This tutorial also does a really great job showing you how to ensure your wooden shelve pieces are square. This really is the most important part of building these shelves. You need to make sure the cuts are perfect (which is next to impossible), and this tutorial shows you how to get around that. A simple take on this project, we especially love the inspiration that comes from seeing their finished product. They elected to stain the outside of the wood while painting the inside in bright colors. If you’re looking for some ways to dress up your DIY honeycomb shelves, click over to this tutorial. Another great example of a project that uses cheap wood, Erika uses fence planks as her go-to wood source. She also adds a shelf to the middle of each hexagon, giving you even more storage and feature options. This project doesn’t put as much of an emphasis on the wood pieces being perfectly square. This isn’t the end of the world - you won’t end up with a perfectly symmetrical finished product, but it will also take you much less time. This project takes our feature from Design Sponge and adds more precision and detail to it. If you want a detailed set of plans with measurements, click over the Up Studio’s tutorial. One of the things we love about this design is that it combines a series of honeycomb shelves into the build, meaning that you need less wood and less finishing work. It creates a more uniform look to the finished product, and creates more sturdiness by linking all of the wood pieces together. ​Perhaps the easiest way to get into woodworking is with a scroll saw - see our collection of free scroll saw patterns and templates. Instructables always delivers great tutorials, and we love this one because it achieves the 30 degree cuts without a miter or table saw. Yes, this tutorial walks you through step-by-step how to use a jigsaw for your hexagon style shelves. We’re not saying it’s easy to use a jigsaw for this project, but we also understand that not everyone has the more expensive saws. If you’re in that camp, then this just might be the set of plans for you. This set of plans also utilizes a piece of wood for behind the shelves to act as a back. We don’t personally feel this is necessary, but if you have a need for that, then these would also be a good set of plans to follow along. If you’re scared away by the thought of woodworking, then look no further. In this Instructables tutorial, they show you how to make honeycomb shelving out of cardboard. Yes, corrugated cardboard. Add some binder clips to hold it all together, and you truly have the most DIY (and cheap) version of this shelving project possible. Green Wedding Shoes, typically known for their featured weddings, bring a nice tutorial for building DIY shelving. This set of plans utilizes a staple gun along with wood glue to hold the wood together. In the end, we love how they display the finished product, and it gives you some new and fresh ideas for how to utilize this modern and stylish set of shelves. They recommend it as a great backdrop for a wedding ceremony, or perhaps at an outdoor bar, and we agree. ​Looking for fun and creative ways to use your band saw? We’ve compiled a list of the top bandsaw DIY projects. Similar to the cardboard tutorial above, this set of plans makes use of paper mache for its hexagon box construction. Incredibly simple, you can finish this project in under an hour. Spray paint the boxes your favorite color and you’ll have them mounted on your wall in no time. You’ll notice that this DIY project has a slightly different take on how the 30 degree angles come together. We love it - it’s a nice, fresh take on the standard way of joining the wood pieces together. A beautiful finished product, we love how this tutorial spends plenty of time talking about how to hang the shelves on your wall. When you are hanging several of these hexagon units together, you’ll need to make sure you have a good system for how it will be affixed to the wall. A few tips: locate your wall studs, and screw the brackets in there.